About the grower: Pruf Cultivar is the flower manufacturing arm of canna conglomerate Groundworks Industries, which holds 22 Oregon cannabis licenses, including those for Serra, Electric Lettuce and, as of September, Farma. Helmed by Farma co-founder Jeremy Plumb, Pruf takes its science seriously, employing uncommonly detailed and technically precise nutritional and environmental controls to stabilize its proprietary designer chemotypes. At a time when consumer demand for high-THC flower has homogenized much of the market, Pruf uses cutting-edge science as a crystal ball to see a few cultural shifts into the future, to a time when consumers are better primed to shop for desired outcomes instead of high cannabinoid concentrations. Aroma and flavor: Though Pacific Juniper smells as evergreen and ginny as its name suggests, the base coats are fairly typical of terpinolene-rich flowers: layers of bubblegum, coconut and pool water, which provide background for wood, spice and pine details. Potential effects: Coupling an unheard of 4.9 percent terpinolene and potent 2.5 percent beta-caryophyllene with a manageable 20.5 percent THC, Pacific Juniper radiates an uplifted headspace—happy and creative, yet with a decent degree of lucidity even when the weed is doing the thinking. Meanwhile, the caryophyllene's anxiolytic and anti-inflammatory properties ground the experience in a soothing sense of calm. Buy it: Electric Lettuce; 203 NE Weidler St., 1450 SW Marlow Ave., 6950 SW 105th Ave.
About the grower: When Pot of Gold planted the seeds for its first licensed crop amid a record flower surplus in May 2018, the grow embodied an against-the-odds spirit reserved for stories about Mighty Ducks and Cinderellas. As native Oregonians returning to their home state's adult-use market after operating in Washington for nearly a decade, Pot of Gold's one-man leadership team had no industry connections to lean on, nor much startup money or major investors. Confronting these limitations, POG went all-in on quality and elite genetics selected in-house from seed—and by virtue of skill and quality alone, POG recently introduced its first flowers via some of the most selective shelves in Portland. 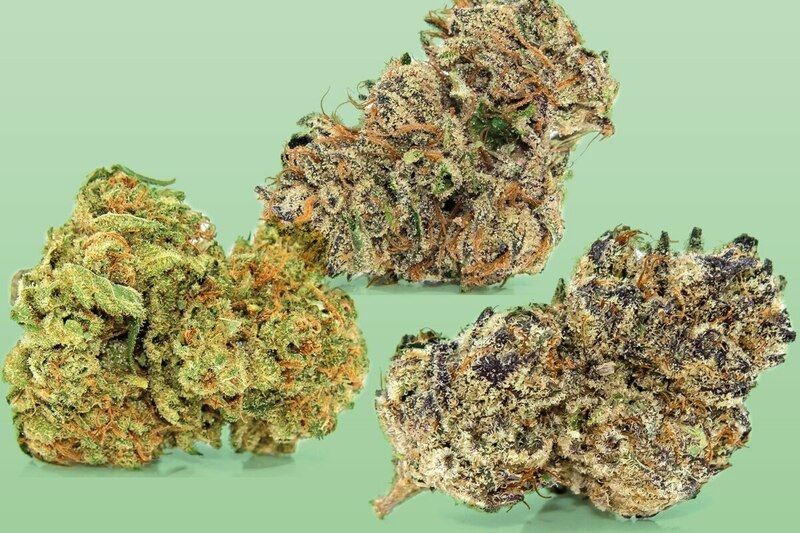 Aroma and flavor: Breeder Cannarado's recent line of exceptionally odiferous Grape Pie crosses has been trickling onto the Oregon market in recent months, and like others from this genetic family—see the must-try Grape Durban—the Golden Grape has a heavy fruit nose. White grapes, apricot jam and yellow raisins all come to mind. Potential effects: Stony, daydreamy and contented are central pillars to the Golden Grape experience—a euphoric, couchlock dosage of myrcene seems to be the most likely dom in this combo of mentally upbeat yet notably sedate effects. Buy it: Kings of Canna, 1465 NE Prescott St.; Urban Farmacy, 420 NE 60th Ave.; Refinery, 2707 NE Broadway. About the grower: When Cloud Cover Cannabis moved in at the old Crown Bottling plant in St. Johns back in 2016, the building had been vacant for nearly 20 years. Yet, by March 2018, the state liquor commission awarded Cloud Cover a tier 2 production license. In August, it began vending its first harvest. Today, you'd never know the space had once fallen into disrepair. The modernized production facility, which received the largest ever Energy Trust of Oregon grant awarded to a cannabis business for Cloud Cover's HVAC design, is a bright, efficiency-focused work of agricultural engineering. A combination of plasma and LED grow lights shortens Cloud Cover's flowering cycle, allowing the facility to fit in an extra crop or two a year. That means these connoisseur-class indoor flowers are created using less energy than competing products manufactured with more common yet less efficient HID lighting solutions. Aroma and flavor: Pencil shavings, lavender and a dark, peppered tone of musk compose Wookie Girl '91's prominent aromatic elements. When smoked, a sharp and floral linalool front emerges in the style of perfume from the woody, Kush-family bag scent. Potential effects: Relaxing, clear of mind and mentally refreshing without much divergent headplay. Significant pain relief and anti-inflammatory characteristics are apparent, while avoiding the heavy sedation often coupled with those traits. Buy it: Belmont Collective, 2036 SE Belmont St.; Bridge City Collective, 215 SE Grand Ave.; Attis Trading Co., 2606 SE Gladstone St.